Nursing students of the Good Samaritan School of Nursing work in the school's dietary laboratory. This photograph was previously adhered to the Dietary Department page of the Annual. Please see the Related Resource field to identify the scrapbook page it is associated with. For a related image, refer to The Dietary Department Page of the Annual. 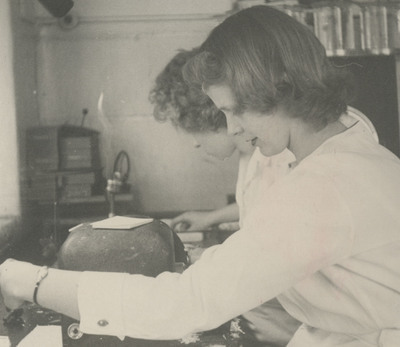 Unknown, "Nursing Students in the Laboratory" (1951). Good Samaritan School of Nursing Photographs. Image. Submission 212.